This weekend I finally got to go out for my birthday. Hehe. We went with our friends Greg and Heather to the Melting Pot, and really, you can’t beat melted cheese and chocolate with fun things to dip in them. It was AWESOME, being in a place we couldn’t possibly have taken our kids (that was actually one of my criteria - they have kids roughly the same age as ours), and enjoying the fondue experience. It was great. SO much fun. Sunday, I started not feeling well, and I think it might be my usual change-o-seasons sickness that happens to me every fall. Anything from bronchitis to pneumonia, ear infections, eye infections, you name it. I assume it’s allergy related, but I’ve lived all over the place, and the same thing happens every year. So tonight (after crashing out for about 5 hours this afternoon/evening) I took some allergy medicine, sudafed, etc. and a LONG hot bath (with my new Boden catalog - yum!) I’m feeling a little better. But still incredibly wiped out. It’s like my body is now coming to cash all the checks I wrote against it in August and the beginning of September. With interest. So I am totally going to bed early (it’s 11:25 p.m.) and see if I can’t sleep this BLEH feeling in my chest and throat and head off. In other, happier news, we added in a session of Now We’re Rockin with Photoshop, our intermediate-level class, which opened registration tonight! We’ll leave the registration open for a few days, since this is the final intermediate class of 2008. 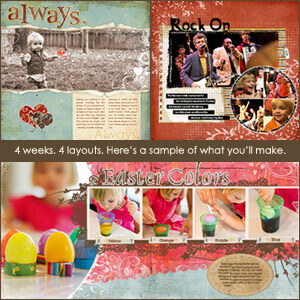 If you’ve made a few digital scrapbook pages before and you’re looking to boost your skills, get inspired, and have a great time, check out NWR. :D Click the link above to check out a detailed course description and to register for class.